Paleo Sweet Potato Bun Lamb Burgers for an easy and delicious Whole30 approved meal. No grill needed, just your oven and some flavorful bone broth! Okay, don’t let this recipe make you think I don’t do actual buns with my burgers. I like to say I am an equal opportunist when it comes to food, but I am always looking for new recipes and ways to spice things up a bit. 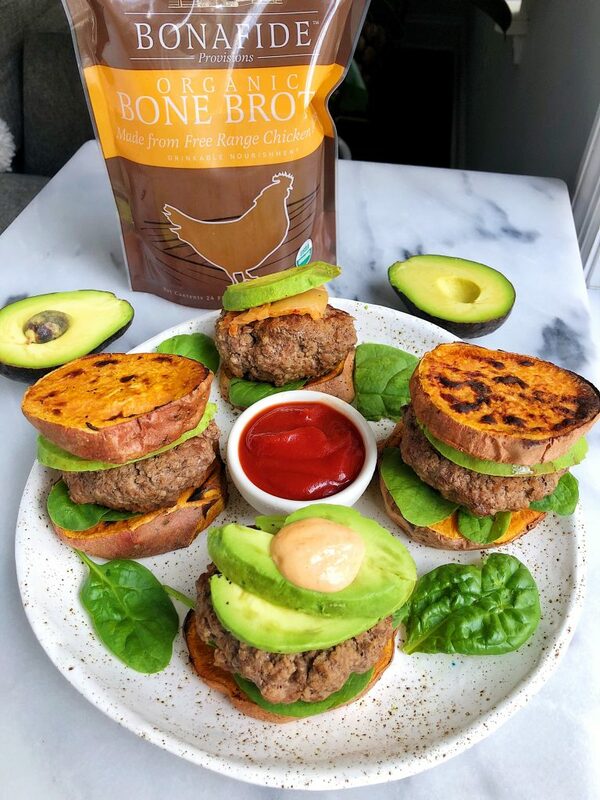 Jord tried doing a mini Whole30 after our trip to Europe (which lasted 7 days), but during it I made these Paleo Sweet Potato Bun Lamb Burgers and they have quickly become one of my favorite recipes to make for dinner now! 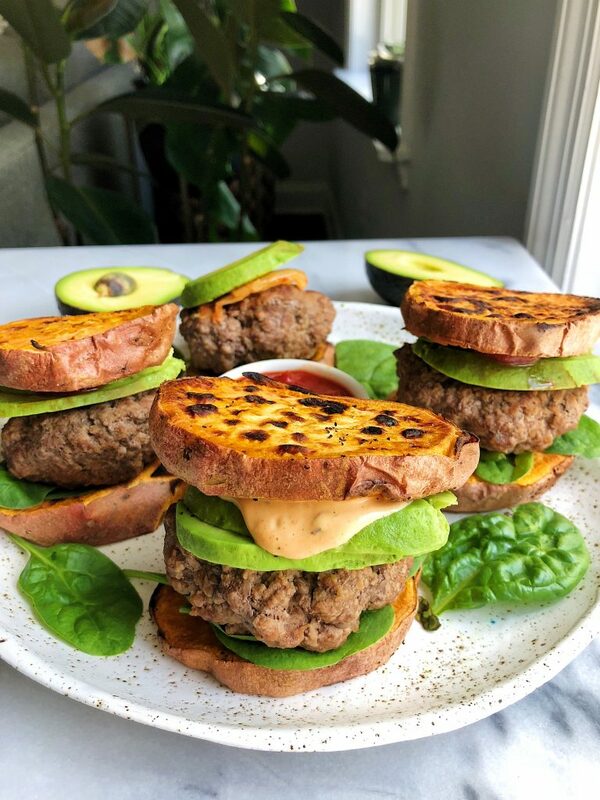 The sweet potato buns are really just wedges of sweet potatoes (we’re not that fancy) and they’re broiled to perfection to make them crispy yet soft and the best consistency for the lamb burgers and all the dream toppings inside. I love adding avocado, some special sauce and some greens. I also added some kimchi to one and it was too die for. The grass-fed lamb burgers are my favorite part of this recipe. Lamb is my go-to burger to make at home. I usually don’t see it on many menus so I love making it every week or two. The flavor of lamb is delicious as is, it is one of those meats that doesn’t need too many spices (at least in my opinion). I used my cast iron skillet to make them over the stove and poured a generous amount of Bonafide Provisions organic bone broth to keep the lamb extra juicy and add even more flavor. Add their bone broth to my recipes as been such a game changer as you guys have seen. Bone broth over the past year + has become a daily staple in my life. I drink it when it is 100 degrees out and I cook with it daily. We stock up on bags every single weekend because we go through them so fast! I love keeping Bonafide’s broth around because I trust the quality of it, it has just the perfect amount of flavor and they offer so many delicious varieties. Have you guys tried those Whole30 Almond Butter Thai Noodles, Green Goddess Mac & Cheese or Paleo Crispy Chicken Nuggets? They all use Bonafide Provisions too and are delicious savory recipes for you! Don’t forget to share your creations with me on Instagram! I cannot wait to see. 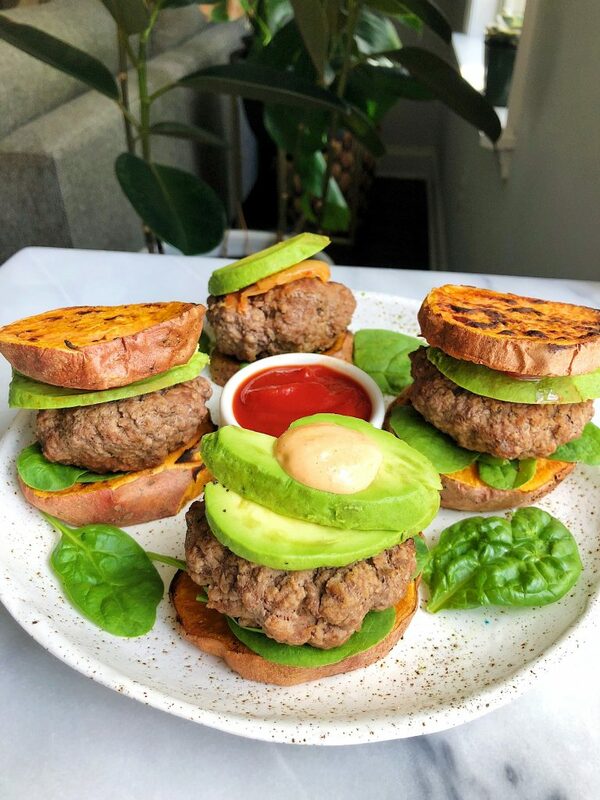 Once done, add the burger to one of the sweet potato rounds with greens, condiments of choice and avocado then top with other avocado round and enjoy!